Louis Pasteur was born in 1882 in Dole, France. Many people are unaware of the fact that he was a chemist. Pasteur received his schooling at the École Normale Supérieure in Paris—a school specifically designed to foster the development of students in the sciences and letters. He was, perhaps, the most accomplished of these students. Pasteur's first major contribution to chemistry occurred when he was only 26 years old, working with French Chemist Antione Balard (1802–1876) in the new field of crystallography. Organic molecules—at the time thought to be made exclusively by living beings—were a particularly important area of study and Pasteur was both fortunate and perceptive when working with a compound called tartaric acid—a chemical found in the sediments of fermenting wine. Pasteur, as well as other scientists of his time, used the rotation of plane-polarized light as one means for studying crystals. Polarized light can be thought of as occupying a single plane in space. If such light is passed through a solution with dissolved tartaric acid, the angle of the plane of light is rotated. Many organic acids display this feature. What made Pastuer's work with tartaric acid and polarized light so important was his careful observation of crystals. In addition to tartaric acid another compound named paratartaric acid was found in wine sediments. Chemical analysis showed this compound to have the same composition as tartaric acid, so most scientists assumed the two compounds were identical. Strangely enough, however, paratartaric acid did not rotate plane-polarized light. Pasteur would not accept the idea that such an experimental result could be an accident or unimportant. He guessed that even though the two compounds had the same chemical composition, they must somehow have different structures—and he set out to find evidence to prove his hypothesis. First, Pasteur carefully observed the paratartaric acid under a microscope. Looking at the tiny crystals, he noticed two different types. While almost identical, they were actually mirror images of each other as depicted in Figure 1. Pasteur's next step required incredibly meticulous work. Again, working with the microscope, he separated the two types of crystals into two piles. After separating the crystals, Pasteur made two solutions—one with each of the piles—and tested how they interacted with polarized light. He found that both solutions rotated the light— but in opposite directions. When the two types of crystals were together in the solution of paratartaric acid the effect of rotation of the light was canceled. Figure 1. Structure of paratartaric crystals. Most importantly for the development of chemistry, these experiments by Pasteur established that composition alone does not provide all the information needed to understand how a chemical behaves. His work allowed chemists to start thinking about the structure of molecules in terms of their stereochemistry , a field that remains important in chemistry research. The discovery of stereochemistry was not the last chemical work carried out by Pasteur. Seven years after he first started working in crystallography (in 1854) he was became a professor of chemistry in Lille, France. Among the main commercial interests in Lille was the production of alcohol in distilleries. 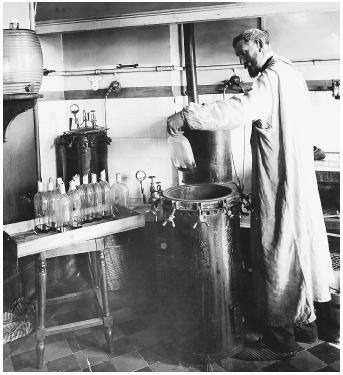 One of Pasteur's students was the son of a distillery owner who was encountering troubles with his factory. Too often the product of their efforts was lactic acid rather than alcohol. Once again, Pasteur would need to contradict current scientific beliefs to answer a chemical question. At the time of his work in Lille, the scientific community knew that the alcohol produced by fermentation came from the breakdown of sugars (found in grapes for wine-making). However, they believed that the breakdown was caused by something in the sugar itself that they called unstabilizing vibrations. These unstabilizing vibrations could be transferred from one vat to a new batch of freshly squeezed grapes to make more wine. What this notion did not explain, however, was why some batches of grapes produced lactic acid rather than alcohol. Pasteur approached this problem much like the earlier crystallography dilemma—by using his microscope to make careful observations. He observed microbes in the wines and noticed that different shaped microbes were present when lactic acid was formed versus when alcohol was formed. He also observed that some of the compounds rotated plane-polarized light, so Pasteur concluded that the microbes were living (because it was thought that stereochemistry was related to living systems only.) Ultimately he was able to help isolate the yeast that was responsible for good fermentation and he solved the chemical problem of lactic acid formation and at the same time invented the field of microbiology. Pasteur went on to make many more advances in microbiology. He also realized the importance of making science an international endeavor and advocated for a scientific approach to the betterment of the human condition. He once remarked, "Do not put forward anything that you cannot prove by experimentation." Pasteur died in 1893, two years after the first international Pasteur Institute was established in Saigon in what was then French Indochina (now Ho Chi Min City in Vietnam). SEE ALSO Chirality ; Coordination Chemistry ; Isomerism ; Organic Chemistry . Debré P. (1998). Louis Pasteur. Baltimore, MD: Johns Hopkins University Press. Geison, Gerald L. (1995). The Private Science of Louis Pasteur. Princeton, NJ: Princeton University Press.